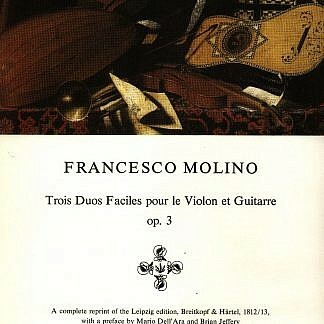 View basket “Francesco Molino – Trois Duos Faciles for violin and guitar, op. 3” has been added to your basket. Francesco Molino (1768-1847) was an Italian guitarist and composer, the author of a famous method for guitar. Born near Turin in 1768, he played in the Piedmont Regiment and in the Teatro Regio in Turin, and during the Napoleonic wars we do not yet know where he was. From about 1820 onwards he was very active in Paris. He wrote two violin concertos, of which the second was dedicated to Kreutzer; one guitar concerto, op. 56; many works for guitar with other instruments; and many guitar solos. Fuller biography of Francesco Molino. 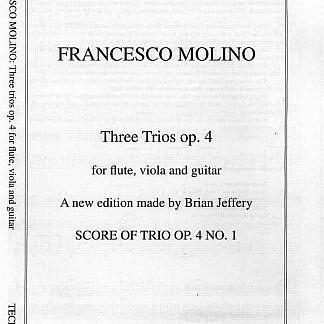 Francesco Molino’s three sets of trios with guitar are particularly fine, all now available in new printed re-engraved editions, score and parts, here in Tecla. Francesco Molino: Trois Trios, op. 4 for flute, viola, and guitar. Francesco Molino: Grand Trio Concertant for flute or violin, viola, and guitar, op. 30. 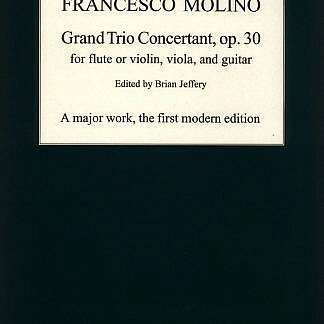 Francesco Molino: Second Grand Trio Concertant, op. 45 for flute or violin, viola, and guitar. We also publish Molino’s Trois Duos faciles, op. 3 for violin and guitar. 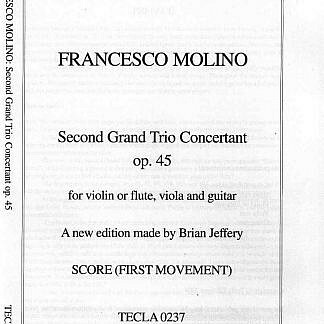 An article by Brian Jeffery about Molino’s Trois Trios, op. 4 for flute, viola, and guitar. 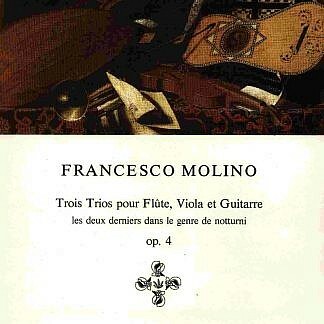 Francesco Molino – Trois Trios, op. 4, for flute, viola, and guitar.